In January, the Empowered Cities initiative focused on how municipalities can use data to promote and design initiatives that increase the financial inclusion of people with disabilities. Joe Albritton, Deputy Commissioner of the Mayor’s Office of People with Disabilities in Chicago, shared his approach. Learn more about Chicago’s program in a broader discussion of accessing and using disability data on our archived webinar – Making Data Work for You. The Mayor’s Office for People with Disabilities (MOPD) and the City Treasurer’s Office, in conjunction with multiple stakeholder groups, are committed to expanding financial inclusion for people with disabilities in Chicago. In order to develop a strategy, we have developed an advisory council and collected data to identify the need. Based on the findings from our research, we are developing a strategy. Forming an Advisory Council. A Financial Inclusion Summit, hosted by National Disability Institute (NDI), brought together leaders from government, the financial services sector and the disability and asset-building communities to discuss strategies for improving financial access for people with disabilities. The summit launched Chicago’s financial inclusion initiative and formed the Financial Advisory Council for the Empowerment of People with Disabilities (F.A.C.E.D.). Co-chaired by the Mayor’s Office of People with Disabilities and the City Treasurer’s Office, FACED brings together a broad range of stakeholders ranging from federal, state and local government agencies to community organizations and educational institutions. FACED serves to develop coordinated efforts to address the barriers faced by people with disabilities when it comes to financial inclusion. Online Research of Banks: We researched 15 large banks, five medium banks and three small banks online to find the following: (1) number of branches in Chicago; (2) number of ATM locations in Chicago; (3) accessibility features; (4) accessibility policy statements; (5) products designed for people with disabilities; (6) active programs and outreach to the disability community; (7) physically accessible branches; (8) accessibility of online banking; (9) accessibility of mobile applications; and (10) customers with disabilities in advertisements. This research shows larger banks (assets greater than $1 billion) offer more disability-related products and services than smaller and medium-sized banks. Sixty percent of the large banks post information on their website about bank accessibility and/or active programs for the disability community. Only one of the smaller and medium-sized banks posted this information. Fields were left empty on the spreadsheet of results if this information was not on the bank’s website. Face-to-face Survey of Individuals with Disabilities: Next, we conducted 200 face-to-face surveys about financial education and literacy at our AccessChicago event. Hosted by MOPD, AccessChicago is a biennial expo promoting the independence and inclusion of people with disabilities by showcasing Chicago’s wide range of accessible venues, products and services. Volunteers administering the survey were able to reach a wide variety of people who may not have come to us. For example, we were able to administer surveys with interpreters working with deaf service providers. This event attracted about 1,500 people with disabilities and their families. Other cities should consider tapping into expos, conferences and/or workshops. What kind of services do you use for managing your cash inflow and outflow? If you are currently unbanked, was there any time in the past that you did use a bank? If yes, what services did you use with that bank? If they felt comfortable responding, we asked why did you stop using that particular bank? What is the best way for you to hear about new banking products? Map of Need: We wanted to identify where the need is, how to reach the disability community and the number of Social Security Disability Income (SSDI) recipients by zip code. We mapped the location of service providers, identified if financial literacy classes or other financial education or coaching is available and tracked currency exchanges. Many of these areas are financial deserts. We would rather have people rely on banking and local banks than currency exchanges. These three pieces of information mapped together provides a baseline of the areas to reach and target our information. Moving Forward: We have formed two subcommittees. The banking access subcommittee starts the conversation between our council and the banks. The resource and engagement committee will enter Year Two engaging with and building model financial institutions; bringing together several financial Institutions that either participated in AccessChicago or have a strong presence in the disability community. These insights will shape our strategy on how to engage banks, share the findings from our research and communicate the barriers to financial inclusion that Chicagoans with disabilities face. We’ll learn more about the products and services banks provide for people with disabilities and how to hold banks accountable for making meaningful progress toward full inclusion. The next step is building financial wellness within the disability community. We are feverishly working to identify funding for someone to keep up the momentum of FACED and make real change in the ability of Chicagoans with disabilities to fully participate in the financial mainstream. As Deputy Commissioner, Joe Albritton oversees Employment Services, Training Services, and Deaf and Hard of Hearing Programs. 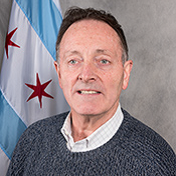 He is a member of the Mayoral Task Force on Employment and Economic Opportunities for People with Disabilities, and the Financial Advisory Council for the Empowerment of People with Disabilities. Prior to MOPD, Mr. Albritton served as a Therapeutic Recreation Instructor for the Chicago Park District and a Job Developer at the Chicago Lighthouse. He is a graduate of Florida State University.